Educational resources are an essential component of the mission of PCSK9 Forum to increase awareness and understanding of PCSK9 science and therapeutics. Our aim is to provide accessible education to clinicians involved in the management of very high-risk patients in their routine practice. 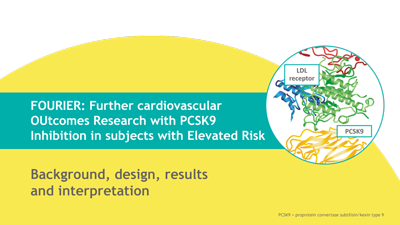 To complement the educational resources available, PCSK9 Forum is developing a series of expert-led slide resources which focus on important trials and critical questions in the PCSK9 field. 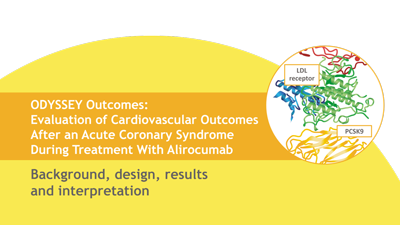 These slide resources will disseminate key results and expert analysis of the major PCSK9 trials. The FOURIER and ODYSSEY OUTCOMES studies are undoubtedly landmark studies for the PCSK9 field. Both provide definitive proof that reducing LDL cholesterol to very low levels with a PCSK9 inhibitor on top of statin reduces cardiovascular events. This is evident for patients with stable cardiovascular disease in FOURIER, and the very highest risk patients with a recent acute coronary syndrome in ODYSSEY OUTCOMES. The first two sets in this slide resource programme give an overview of the rationale, design, results and interpretation of these critically important studies.